It's been over two years since we started our journey with Heguru Education and from time to time, I still get questions from friends and readers on why we choose to continue, how have the lessons benefited the kids and if they are happy to go to class. I think that last question is the most crucial one since I am an advocate of happy childhood and the deciding factor for me is in seeing that while some of their classmates' interest dwindle over time, my kids are still deriving joy from the lessons all this while. This is apparent from how they look forward to their weekly classes, how they love to interact with their teachers after class, how they pay close attention instead of letting their minds wander off and how they will protest whenever I suggest maybe we should take a break so that we have more time to play on Fridays. Yes, true story, they are the ones who cherish their lessons so much that I think that is also why they are reaping as much as they can from this whole experience too. This boy looks forward to his weekly lessons at Heguru Education and enjoys the activities now that he is two and a half years old. I am thankful that this is the first and only class he attends as it helps him develop a love for learning. 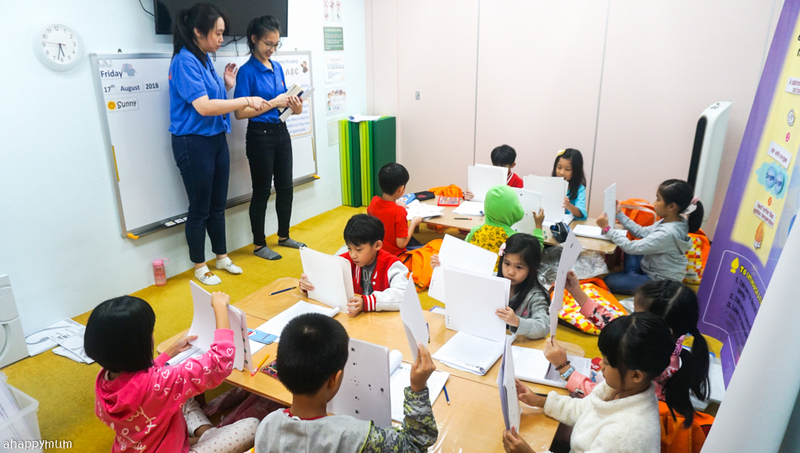 In celebration of their 5th anniversary in Singapore, Heguru Education has just opened its 5th centre in Punggol Oasis Terraces to allow more children to experience the wonderful learning journey and benefit from Heguru brain development enrichment. Yup, we've been to Oasis Terraces and it's the latest hype for families staying in the northeastern part as the mall boasts a kids playground and water play area, a Popular bookstore, a fairly large NTUC, a polyclinic next door, many restaurants including Dim Sum Inc by Crystal Jade, Saizeriya, Tendon Go and there is ample outdoor space in the community plaza where kids can feel free to scoot, cycle, run around or visit the park. Since I've already covered the lesson contents, my kids' improvement over time and why I think it is good to start from a young age for the Heguru journey, in this post, I will be doing a Q&A based on the most common queries I get and if you have anything else you wish to know, don't hesitate to drop me an email or a comment and I'll answer you in the most truthful way possible. The preschooler has improved by leaps and bounds this year, especially in terms of her memory, analytical and reading skills. I used to be a little worried for her but now, I'm pretty confident that she is going to do just fine when she enters Primary One next year. Why do kids have to start young for right brain training? Research has shown that the brain develops fastest from birth up to six years of age, therefore this makes it a crucial period for right brain training to be most effective. Exposing a young child to quality stimuli will allow him/her to accumulate a vast library of knowledge in the subconscious mind. According to Heguru, if the right brain of your child is left untrained during this time frame, the rapid rate of learning decreases and your child’s innate right brain abilities becomes dormant beyond the age of six. When is the best age to start? I don't think there is a best age but since I have three kids who started their Heguru journeys at different ages and I've seen how they bloom individually, I would recommend you to start when your child is between one to two years of age and to continue for as long as you can. This is because it takes time to fully utilise a child's potential and you shouldn't expect to see outstanding results by just attending a couple of terms of lessons. What are the minimum and maximum ages? At Heguru Education Centre, there are four courses which cater to babies and children aged from 6 months old up till 12 years old. The Primary Schooler course never fails to amaze me by how many activities are packed within a short lesson but more importantly, how these kids seem to be able to have the power to keep up with the flow and be able to maintain their focus. My firstborn is so in love with the lessons and her teachers that she says she wishes it would never have to stop. Does the left brain get developed too? The Heguru program is designed in such a way that there are three stages of teaching. 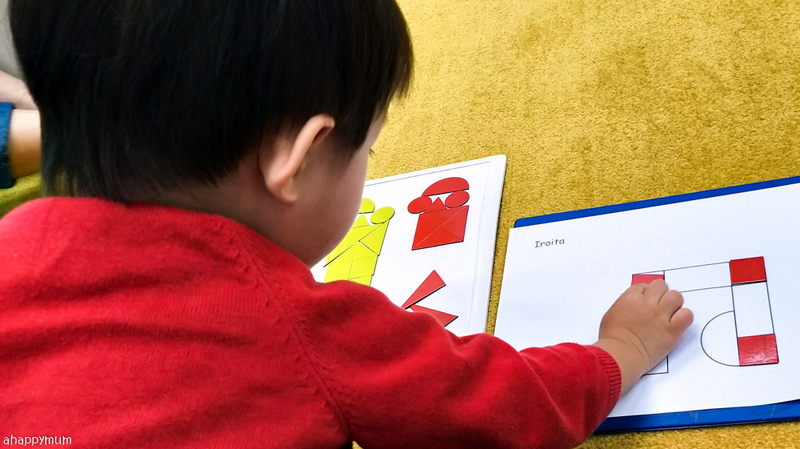 The first stage is catered to teaching very young children, from birth to 3 years old. At this stage, the baby’s right brain is just starting to develop. Hence, the emphasis is more on the right brain. The second stage is during the preschool years, from 4 years old to 6 years old. During this stage, the left brain - which is the analytical and logical side - starts to develop, and more activities are introduced to stimulate the left side of the brain, and also activities to bridge the left to right and vice versa. The third stage is the Primary School stage, from 7 to 12 years old. During this stage, there is a greater focus on the left brain and on developing both sides of the brain. There will be more activities to synergise the left and right side and bring out the best of both by strengthening, bridging and harnessing their abilities. Do I need to accompany my child for the lessons? For the Infant and Toddler Course, it is parent accompanied and a parent/guardian will be required to sit in with the child. Some of the activities will require the adult to guide the child along and I see it as a great opportunity to bond as parent and child too. 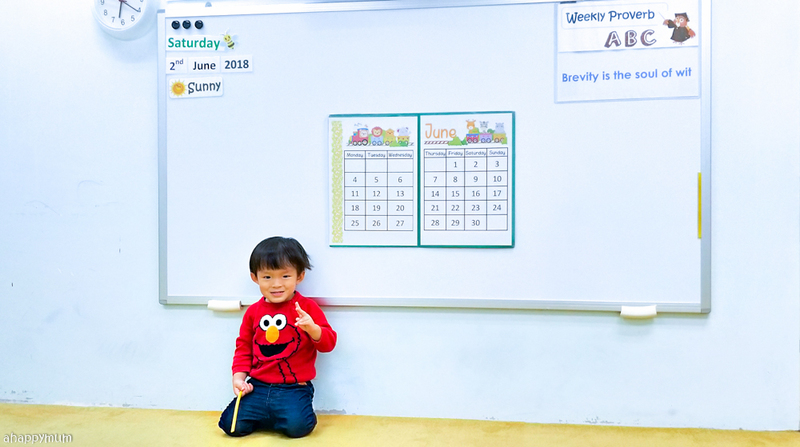 For the Preschool Course I onward, the students will attend the classes independently. Where is the nearest center I can go to? Heguru Education Centre currently operates five centres in SingPost Centre, Our Tampines Hub, Sengkang, Waterway Point and Oasis Terraces. For more information or to find more about the programs and vacancies in each centre, you can contact and give them a call here. Note: The centres under Heguru Education are not affiliated to the other individually managed Heguru centres in Singapore, such as Heguru Method (Harbourfront and Choa Chu Kang), Heguru City Square Mall and Heguru Sembawang..
Will my child be able to begin class immediately upon registration? This is subjected to whether there is any vacancy in your desired time slot and you can check this by visiting the center or giving them a call to find out. Taking a short break and having a fun activity before resuming the lesson. A simple action like throwing a ball or skipping a rope helps them to recharge and be better able to focus in the second half of the lesson which usually involves writing. What are some of the activities covered in a typical lesson? I did a lesson overview in my first review and broke the main activities down into 12 categories. If you haven't read it yet, please go here because it will give you a much clearer understanding of what goes on in a typical Heguru class. Do we need to do homework or home practice? It is recommended that you complement the learning with home practice and for us, while I might not have time to do much revision with the kids, we try our best to at least finish the home assignments. The toddler does not receive any homework but the preschooler and primary schooler do receive a set of homework every week. It is not mandatory to complete and the teachers are totally understanding if your child is unable to finish it from time to time, even though it is strongly advisable to do so. Just so you know, Heguru Education has this points rewards system whereby the students are able to achieve points for doing their homework and for completing class activities within the stipulated time. Once they accumulate enough points, they can use them to exchange for small gifts as a reward for their effort. Most of the gifts are items from Daiso but they work wonders in motivating the little ones to stay committed and to focus in class, so I'm all for it. Regretfully, there is no make up lesson if you skip a class for some reason. The consolation is the lessons are independent of each other so there is no worry that your child cannot catch up if he/she misses one or two. Practising the Hado Reading method which helps to rapidly absorb information from a book. 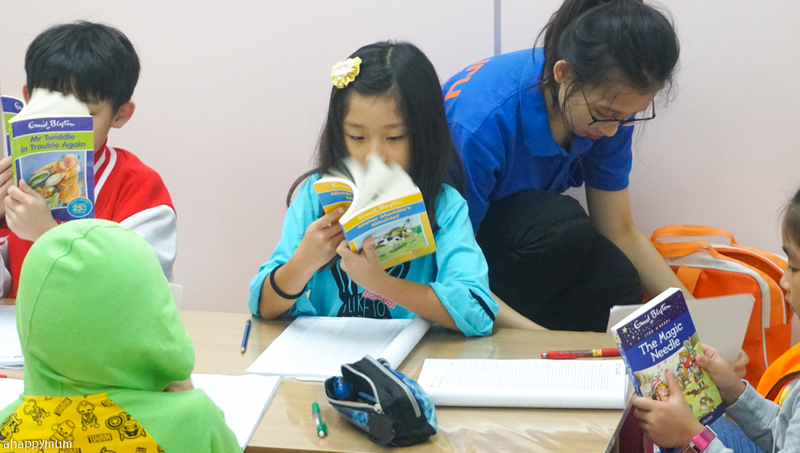 I must say this girl has really become quite good at speed reading while being able to retain the contents, and this is an invaluable skill for her in her learning journey. How many teachers and students are there in a class? For the Infant and Toddler Course, there is a maximum of 7 students and there will be 2 teachers in every class. 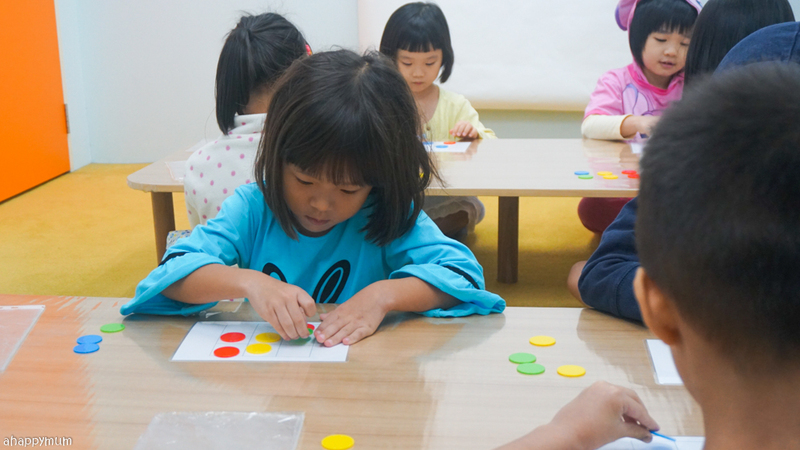 For the Preschooler I and II Courses, the maximum is 12 students and there will be at least 2 teachers. For the Primary Schooler Course, the maximum is 20 students and there will be at least 3 teachers. My girl says sometimes there can be as many as 4 teachers as the activities take place really quickly and more teachers need to be on hand to help facilitate the process. Note: Even though there may be more than one teacher for every class, there is always just one main teacher and the rest act as the assistants - the ones who help to get the materials ready, mark the student's worksheets, bring the kids to the loo, keep the class in order etc. Having one consistent main teacher helps to build up a sense of familiarisation in the kids and makes them settle down in class quickly. How long does my child need to attend lessons before I can see results? This is a subjective question and it all depends on the individual, which can vary from case to case. What I would say once again is that parents should not expect to see significant results if you are only sending your child here for a term or two. In my humble opinion, give it a go for at least a year and if the child is happy to come to class and enjoy the lessons with the teachers, I am quite confident that he/she will reap the potential benefits of right brain training too. Do my kids enjoy the classes at Heguru Education? Absolute YES, and it has been so for the past two years. They will willingly wake up from their afternoon naps so that they can make it in time for class, they have never complained about the homework they did to do but instead do it with zest, they always have fun things to tell me about class and how much they enjoyed it, and they give me this dejected and sorrowful expression whenever I say that we might stop going for classes soon. My kids are not enthusiastic about every kind of enrichment class, for instance my eldest gave up on swimming and piano because she just wasn't keen after a while, but for Heguru, it just seems like her interest has not wavered after so long. Solving puzzles is one of the things we love to do most in a Heguru class and we get the opportunity to do a handful every week. The toddler loves to do the Iroita puzzle where he has to pick out the correct shapes and put them in place. What makes them look forward to the lessons so much? One of the main reasons is that the lessons are fun and jam packed with activities. 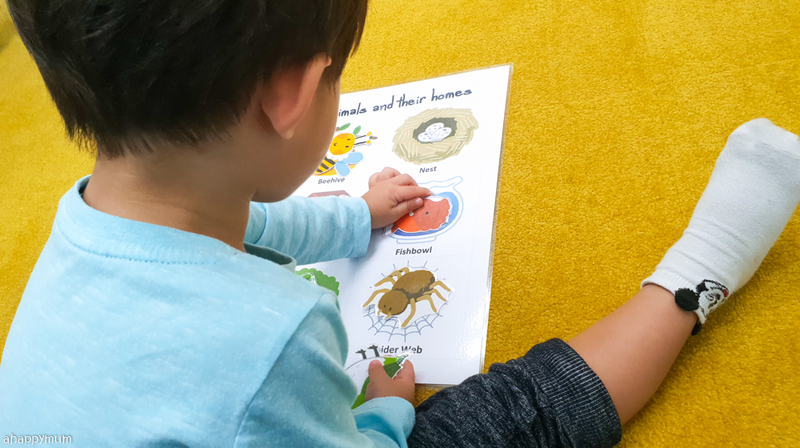 Unlike some enrichment classes which demand for lots of writing, speaking or listening to the teacher, a Heguru lesson has a broad variety of hands-on, fun-filled and interactive activities which makes it less theoretical and less dull for the little ones. To my kids, it's more of learning through play and they love participating in the activities and having fun through the memory games, solving of puzzles, song and dance and so on. Another huge pulling factor for us is that the teachers are very kind, friendly and passionate in what they do and my kids have established a close relationship with them. They look forward to seeing them each week, to telling them about their week in school, to sharing of special events and even to hanging out with them for a while more when class ends. That teacher-student bond, to me, is invaluable. How has Heguru benefited my kids? Firstly and most importantly, I think Heguru has helped my kids to develop a love for learning - which I believe lays a strong foundation for them at this young age and helps them to find the joy and passion in their quest for knowledge. Secondly, their memory skills have improved by leaps and bounds, especially for the girls. This is apparent from their weekly spelling tests in school which they don't take long to practise, an ability to remember details on incidents that happened, how they pick up new songs really fast and how they can remember things like dates, times, contact numbers, grocery shopping lists and so on. In addition, their attention span is now better than before, which is particularly evident in the case of the toddler. For instance, he was never able to sit still for a lesson at the beginning but nowadays, he does it with ease and answers the questions that the teachers asks without wanting to fidget much, talk or stand up to walk around. They also have stronger analytical skills when it comes to solving problem sums, answering tricky logic questions or solving mind-boggling puzzles. It's almost like they enjoy taking up challenges which is a good thing to know. Last but not least, I think all three of them have had a boost in their self-esteem because they now realise they have the ability to accomplish things and become better over time. They can achieve what they didn't think they could, for instance learn a foreign language, appreciate the arts, remember a passage in a matter of seconds, count at a fast speed, speed read a book, memorise a string of numbers and so on, which makes them believe in themselves more. He has grown so much in the past year and his Heguru lessons have definitely helped him in terms of phonics, general knowledge, logic and memory. This was an activity he did where he had to pick out the correct home for each of the animals and he could do it at ease without my help. Our journey with Heguru Education has definitely been a positive and beneficial one, and I'm thankful for the opportunity given to us and glad that we managed to stick to it for over a couple of years. I'm pretty sure that this has helped to form a good foundation in their early years and will always remain as a fond part of the kids' growing up experiences. Be reminded that right brain training has to start from young so if you are keen to help your child develop his/her full potential, it's never too early to begin. Disclosure: We were invited by Heguru Education Centre to review their courses and the kids attended complimentary lessons in return. All photographs and opinions are our own.